Yup, I made a galette out of grapes. I know, I know, you probably just snack on grapes or maybe scatter them into a chicken or waldorf salad. But making a pie out of my favorite grape ever is a worthy cause. Add a scoop of vanilla ice cream and I’m in heaven. Best thing, it’s not even hard to make. You can get the recipe and the story over at Poppytalk, where you’ll find me posting about food on Wednesdays. This looks delicious. You're right. Most people don't think to really cook with grapes, but I would love to try this recipe out! Great idea! I had a ridiculous glut of grapes a few years ago (from a fruit basket) and, in desperation, made a grape crumble to use them up. It was delicious. Now that I think about it, I've got an awful lot in the fridge right now…. I've never eaten coronation grapes nor have I ever seen them in the supermarket but I do love this cornmeal crust and have made it before with fantastic results. I have a sweet tooth so perhaps a sweeter, less tart grape might be better suited for me. Coronation Grapes? Something to much on while watching coronation street! I love ( and had success) with your galette recipes before…so I look forward to trying this one! Grape pie! yum! I actually just stumbled upon a fabulous sounding burger recipe that is stuffed with gorgonzola…and grapes. Go figure. So, there not just for an after-school snack anymore. This looks fantastic. they're…not there. DOH. See, lack of sleep = poor spelling and grammar. I never think to cook with grapes. They usually sit pretty on the counter and get snacked on all day. Great idea to put them in a galette. I can only imagine how delicious the warm fruit would be bursting in the mouth. Yum! Everyone seems to be cooking with grapes these days! Seems like a good trend. 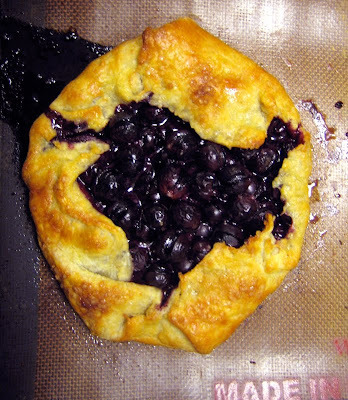 I just love this photo of the galette on your very-loved Silpat. Eva, try it. It's really really good. Lemon, a crumble sounds perfect! Bijoux, look for the grapes, they are amazing. Even with a sweet tooth. A burger, sounds awesome. I'm a secret burger-fiend! I always snack on them too, Eralda, but use them in a pie when they get a bit soft. Yum. Is it a trend, Leftoverist? I just love grapes! Mmmmm. qué rico, me comería un trocito. oh this looks amazing! never cooked with grapes but I LOVE grape juice! looks amazing! DAMN – a few days late! I just used up the last of my coronations. Might have to go buy more? Julie, you can never have too many coronation grapes!